The Grants Management Office (GMO) facilitates the research efforts of UNSW staff through the provision of pre-award grant services and the management of all post-award activities for external research funds (both grant and contract research). The GMO also provides full management services for ethics monitoring. All grant applications to be administered at UNSW must be submitted through the Grants Management Office. The GMO provide advice on funding rules and review applications for compliance and eligibility issues prior to submission to the sponsor. Visit the Contact Us page to locate a staff member. 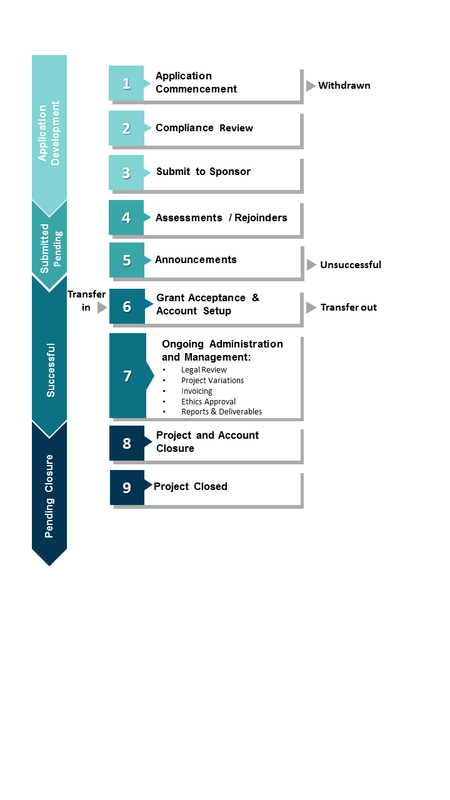 The grant process follows actions along the lifecycle and are grouped into four main phases - application development, submitted pending, successful and pending closure. Subscribe to the Grant News Bulletin for regular updates on grant funding opportunities. To subscribe, send an email to grantsnews@unsw.edu.au from your UNSW email account. Service available to UNSW staff and students only. The GMO houses a digital library of successful applications for a wide range of schemes.